I told you all about ImageFramer in November of 2009 (here). Now they have launched a new major version, adding photorealistic frames and decorative borders to photos and images of art. Version 4.0 introduces dozens of improvements, including an Adobe Photoshop Lightroom Plugin, Batch Processing, integration with Apple Photos, and the capability to export and import frames and design templates. 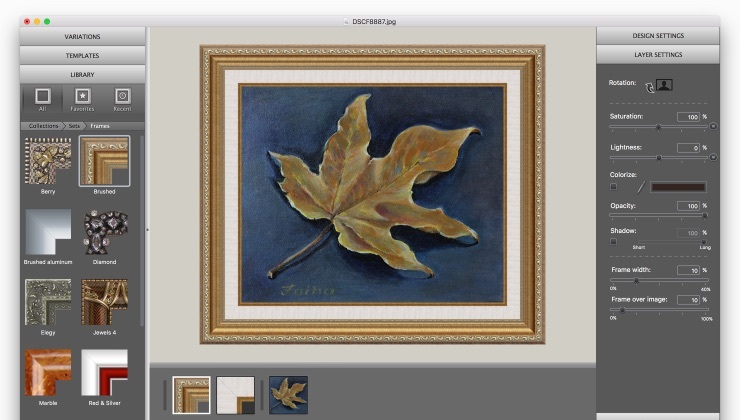 ImageFramer is the tool of choice for photographers, visual artists, scrapbookers, interior designers and framing professionals for previewing how their art looks in a frame, presenting their work to clients, or in portfolios. With over 1000 customizable frames, ranging from traditional frames through holiday-themed designs to modern and specialty borders, ImageFramer is an indispensable tool in a photographer's or artist's toolbox. 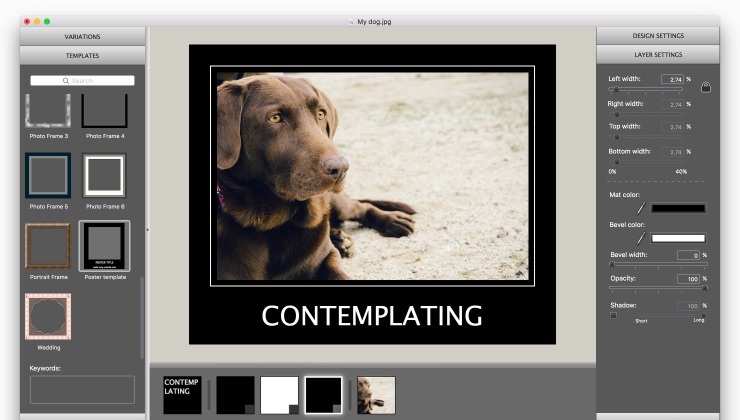 With ImageFramer 4, we focused on improving the workflow for photographers .... We developed an Adobe Photoshop Lightroom export plugin, Apple Photos editing extension, and a built-in Batch Processing module. Additionally, exporting and importing of custom designs eases collaboration between ImageFramer customers. ImageFramer 4.0 is available in three pricing tiers: $29.95 (USD) for ImageFramer Lite, $39.95 for ImageFramer Standard and $69.95 for ImageFramer Pro. All versions require macOS 10.11 (El Capitan) or later. Demo versions are available at Apparent Software online. For more information, please contact Jacob Gorban. Winnipeg, (MB) Canada - Located in Winnipeg, MB, Apparent Software Inc. is a privately funded company founded in 2006. With a focus on the Mac platform, its mission is creating useful and friendly software, complemented by first-class customer care. Apparent Software is the developer of ImageFramer, Cashculator and Trickster applications. Copyright (C) 2017 Apparent Software Inc. All Rights Reserved. Apple, the Apple logo, Mac, macOS and OS X are registered trademarks of Apple Computer in the U.S. and/or other countries.